Graeme K. Talboys was a teacher in schools and museums before he became a full-time writer. As well as works on museum education he has written a number of general non-fiction books. He has also written several fantasy novels. His latest series, Shadow in the Storm, is being published by HarperVoyager. He lives in Scotland with his wife and two cats (and 5 million Scots). You should follow him on Facebook or Twitter. It is likely the first ‘archaeologist’ to come to mind when mentioning characters in sf&f is Dr. Jones. Or Lara Croft, depending on your medium of choice. Their exploits, whilst accepted as not typical of the actions, behaviour, and ethics of genuine archaeologists, certainly colour a lot of people’s perceptions. There was a time when antiquarians raided tombs for treasures. They did untold damage and were, in their way, far worse than grave robbers as they were generally educated gentlemen who should have known better. The same holds true for a lot of archaeology in written works of fiction. There is, of course, the need for a touch of poetic licence, but as someone versed in archaeology (and museums) I often cringe at the way in which it is depicted. Although the television series Time Team proved that you can dig a site in three days and extract a lot of useful information, a dig is only a small part of the archaeological process. Planning can take years. Not just the gathering of sufficient manpower, but putting in place finances, gaining legal permission, hiring equipment and operators, arranging accommodation for all those working in the field, and so on. And then comes the analysis of what has been found, which can take decades. You find what you’re looking for about ten seconds after you start digging. No. Indeed, archaeologists are unlikely to be looking for anything specific in that sense. Sites are chosen because they are likely to yield a wide amount of information about a given period (usually the one in which the dig director is a specialist). It is true that amazing things can turn up on day one. But it is rare. You are just as likely to dig for six weeks and uncover a few stones that may or may not be associated with the foundations of building. And if there is anything really interesting to find it’s almost certain to be under the spoil heap or found on the last day. There is no doubt that technological advances have made archaeology more interesting – ground penetrating radar and other geophysical applications along with aerial photography, lidar, 3D scanning, and the use of powerful portable computers have added to the mix. They have certainly made it easier to decide where to dig, but there is no substitute for digging a hole and scraping soil whilst watching with experienced eyes. Treasure is rare which is why it hits the headlines – most finds are bits of broken pottery and the remains of food, stuff our ancestors threw away. Beware. Saying: “Archaeology is rubbish” will not make you many friends in the archaeological community. They’ve heard it before. No it’s not. Palaeontologists do that and the last thing you want to do is tread on their toes in case they unleash the reconstituted raptors. It’s just about old objects and of no real use to the real world of today. Old objects are just the starting point. Archaeology is more about the story that can be derived from the object and the context in which it was found. Reconstructing this story from the evidence allows archaeologists to uncover patterns of human behaviour and the reasons for change, human health and diet, the importance of environment, resource distribution, and in more recent time urban planning, as well as the way in which all these elements and more are linked. This information in turn is of inestimable value to modern planners, doctors, and any politician worthy of the name. And there are more than a few countries with economies that rely on archaeological tourism (which is why certain groups destroy them after having looted the moveable items for sale on the black market). An archaeologist is an archaeologist. Experimental archaeologists, who test archaeological hypotheses, usually by trying to replicate how something may have been done in the past. Historical archaeologists, who study written and oral records of the past. 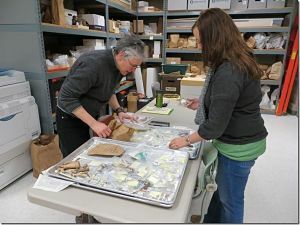 Environmental archaeologists, who specialize in the relationship between ancient peoples and the places they lived. Surveyors, who collect information about the location, distribution and organization of ancient human cultures across a large area. Underwater archaeologists, who study remains found in, around or under salt or fresh water or buried beneath water-logged sediment. I could go on. I expect you want me to stop. Yes, archaeology is usually safe, but then sometimes it isn’t. Deep trenches can collapse. Constant rain or sun can sap your health. There are insects and diseases. Industrial sites can be toxic. Battlefields of the twentieth century contain unexploded ordnance. And native peoples do sometimes take umbrage (although if your director hasn’t done their homework in this respect it is legitimate to offer them up as a sacrifice). That all being the case, what can anyone including archaeologists and archaeology in their fiction do to ensure they are making an accurate portrayal of the people, their work, and their findings? They are either typing reports, reading reports, examining artefacts, grading papers, filling in forms to apply for funding, preparing materials for exhibition, attending meetings, quite possibly sneaking in the odd game of Angry Birds. 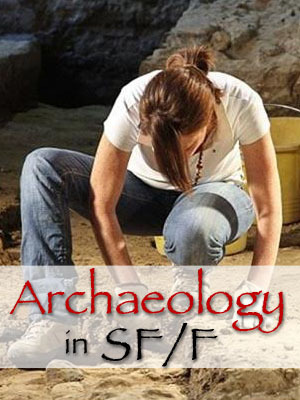 Whilst this doesn’t make for an exciting read, some effort should be made to convey the idea that archaeology is pretty much like any other job. Although, that might just be the motivation for an archaeologist to do something a bit dangerous or unusual, just to break the routine. Too bad if it starts the countdown on a planetary doomsday machine left there from a warship that crashed 5 millennia before. They will be youngish, poor, very likely to be a disappointment to their parents (who probably wanted them to be bankers or doctors) and the majority of them will go on to be something other than archaeologists when they graduate. There just aren’t the jobs, and those that exist are poorly paid. They are doing it because they love it. Which leads nicely to the next point. It is one of the few fields of endeavour where everyone in a team is likely to be there because they want to be there. That doesn’t mean everyone gets along, but they have the love of their work in common which makes a strong bond and creates fertile ground for intense discussions about what they are doing. It is at the back of the queue when the funding is given out. Very few people in positions of authority see the worth of it, and quite a few wish it would go away as it tends to hold up engineering and building projects. Digs, in particular, are overstretched. There’s never enough people and never enough time. What was once a leisurely gentleman’s pastime is now usually done against the clock. If it isn’t, it means the site under investigation is in some forsaken place subject to poor communication, harsh conditions, and no pub. A lot of archaeologists work in museums. It is difficult to predict the future of science. Science fiction is littered with failures. Some things can be extrapolated. Advanced geophysical surveys are already undertaken from orbit. One suspects the quality and resolution will increase. In the end, however, it always comes down to trowels in the trench and the human eye. It is why, even with today’s technology, you will always find people at a dig and back in the lab drawing artefacts and their contexts. They learn to pick out the detail that is important. They need to have an understanding of the principles of everything under their command (navigation, engineering, diplomacy, law, and so on), but they are not expected to be experts in everything. Their greatest role aside from their own specialism is being a good leader and organiser. Archaeology has an ethical dimension that is often neglected in storytelling in favour of the artefact. Digs are often culturally sensitive, especially around the exhumation of human remains and artefacts of religious or spiritual significance (which for some cultures is everything). Any interference with the past raises issues. Most archaeologists work ethically although there are areas which I won’t get into here where it is highly politicised . These areas in particular do need exploring in fiction and offer the greatest opportunity for gripping narrative. Archaeology: A Very Short Introduction by Paul Bahn, Oxford University Press (978-0199657438) offers a short, inexpensive overview. Archaeology: An Introduction – 5th Edition – Kevin Greene and Tom Moore, Routledge (9780415496391) is pricier, but both comprehensive and comprehensible. A novella in the Cthulhu Mythos about an expedition to Antarctica revolves around the discovery of an ancient, cyclopean and inhuman city. The exploration of an incomprehensible and deadly structure on the Moon which tackles the notion of how do you make sense of something that is alien. Archaeologists explore the remains of an ancient civilization and go in search of the culture that created them. Not strictly speaking archaeology, it does highlight the real problem of formulating any understanding of an alien culture from artefacts that are just plain baffling and defy scientific study. An archaeological expedition studies a civilization to determine the cause of its demise and battles against interference from an Earth in turmoil. Archaeologists follow a trail of discoveries across the galaxy to try to discover what connects a series of vanished civilizations. An alternate future where the Aztec empire rules human space with an archaeologist as the main character. I would add to your list of fiction, The Ship Who Searched by Anne McCaffrey and Mercedes Lackey. The main character has parents who are small site archeologists and she carries on the interest. In fact, she gives her partner a minor dissertation on “what can get well-armed archeologists,” including disease and natives.